True mosses (Phylum Bryophyta) are non-vascular plants that typically grow between 1-10 cm tall, usually growing densely together in carpet-like structures. Mosses are limited in their height due to the lack of vascular tissues, relying on capillary action for upright movement of water. Like liverworts and hornworts, true mosses attach to their substrate via rhizoids and live a gametophyte-dominated life cycle. 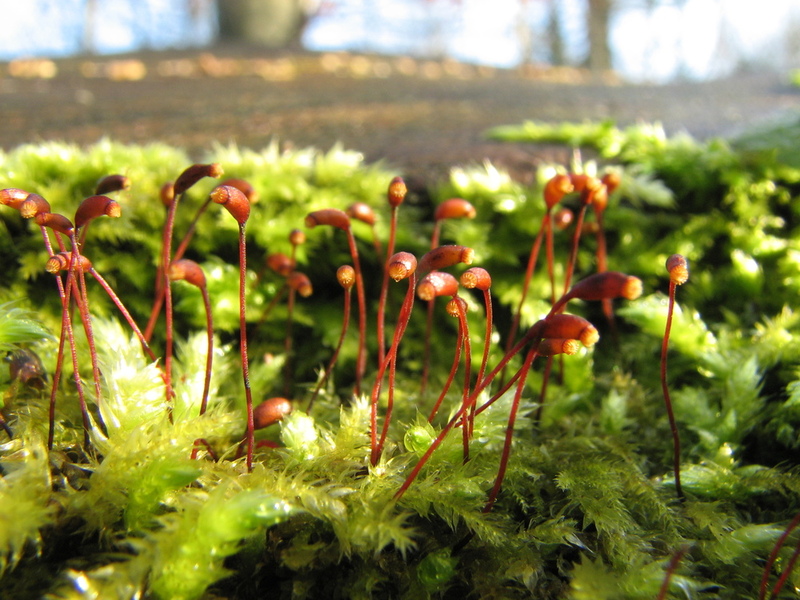 Mosses (like liverworts, hornworts, and seedless vascular plants) reproduce via fertilized spores. Moss. The green vegetative microphylls with emerging sporagium (which hold the sexual spores). Photo: Lordgrunt 2008. Source: Wikimedia Commons. Single sporangium of a moss. Photo: Thomas Bresson 2012. Source: Wikimedia Commons. Photo: Brian Calloway 2010. Source: Wikimedia Commons. Photo: Philip Halling 2007. Source: Wikimedia Commons. Moss life cycle. Illustration: LadyofHats 2005. Source: Wikimedia Commons.